So you run on down to your local running shoe store and see that wall of running shoes, your vision blurs, your head pounds. You ask yourself: "What do I need to run comfortably and stay injury free?" The "wall" has shoes with all sorts of technical features. Each seems to outdo the other with patented claims for stability, cushioning, maybe weight loss or hair growth and whatever this motion control stuff is. There's this year's model and left over shoes from last year. What's a runner to do? 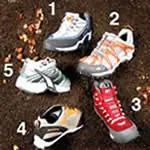 If you're lucky, a knowledgeable sales person who kind of looks like a runner asks you what type of shoe do you need? How much do you run? Have you seen our new VTRO-techno-cushion shoe? Are you a neutral runner, or do you need stability or how about this motion control shoe? I'm thinking—"I'm not taking a cruise, so I don't think I need motion control and I feel pretty stable, but I do like cushion—doesn't everyone?" If you're confused about running shoes—join the club. Read on for an understanding of running shoe technology and picking the right shoe—for you. There is only the best running shoe for you. Because each runner is unique in how much they train, and what their running style, there is no "perfect" running shoe. The best running shoe for you depends entirely on the shape of your foot, your bio-mechanics and on the amount of running you do. Running shoes are designed to protect your feet from the road, provided traction on different surfaces, cushion the landing shock and support your feet. Not too much to ask, or is it? Running shoes are designed to handle the shock of 2.5 times your body weight that is created by the impact each time your foot strikes the ground. When you're running, you want to have excellent cushioning in both the heel and forefoot to handle this impact. If you plan on running three times a week or more, move up to a real running shoe. Why buy a real running shoe? Because you want to LOOK FAST of course. OK, really, running shoes provide the best protection for your feet, legs and body from the repeated stress of thousands of foot landings per mile. Each time you take a stride and land, your foot has to absorb two to three times your body weight. This repeated impact is different from other sports. Running shoes have built-in features that enable you to run day after day more comfortably and with less chance of over-use injury. Even before you step inside a store, you need to know what type of foot you have. Yeah, it's a stinky job, but somebody's gotta look at your feet. Take a good long look at your feet. Feet, just like people come in all sizes shapes and designs. Is your foot like your uncle Alfred's with a wide forefoot and flat arch? Or, do you have a sleek high-arched foot like your funny Aunt Rose? A running shoe that fits is very important. For the best fit and the most comfortable running, match your foot type to the shape and components of your running shoes. Feet can easily be divided into three categories; low, high and neutral arches. Someone may have called you flat footed in the past, no it doesn't mean you are slow. Stand up and put weight evenly on both feet. Look at your arches. Does your arch almost touch the floor? Does your foot or ankle roll in? People with low arches tend to have stability issues like over pronation. Is your arch really high? Can you almost fit a golf ball under your instep? (Don't do that--golf balls are hard) The high-arched foot usually has the opposite problem. That means your foot rolls to the outside or "supinates." If you have neither a low or high arch, then lucky you—you're somewhere in the middle (you've got lucky genes). The neutral foot is the easiest to fit and assuming you have no other structural issues you can run efficiently and comfortably with a lot of shoe designs. Be sure to check out our other articles for new runners, including what a runner's building blocks are, how to take your first steps as a runner, the basic gear you'll need, and how to build your mileage. Mike St. Laurent is the designer and founder of Loco Running, the shoes designed by runners for runners. Go to www.locorunning.com for more information.